You are here: Home » Could Stockton’s urban renewal start on the water? A bit more lawlessness might be just the thing Downtown Stockton needs to kick its rebirth into high gear. It might seem counterintuitive, but those familiar with urban renewal suggest a bit of rule-bending sometimes helps communities take root in historic urban cores. They’re not suggesting the lawlessness of assaults, vandalism or petty theft, but the type of creative legal interpretation that has helped create artist villages and funky urban oases in other cities around the country. In a conversation several weeks ago, Cort Companies broker Mahala Burns explained to me that the renaissance of some New York neighborhoods was boosted by what is essentially squatting, wherein people looking for a new place to live turn unused lofts and abandoned spaces into housing. In many of these neighborhoods, their small-scale reclamation projects were largely ignored by regulatory agencies and allowed to blossom into self-sustaining communities. And once the notion of turning these areas into livable locations gained traction, moneyed interests stepped in and turned the once off-the-radar spaces into legitimate housing. In the right context, those shipped out individuals can be thought of as urban pioneers, setting up a real community where others fear to tread. Conveniently, Stockton has plenty of space that can be thought of as urban frontier. It just probably isn’t in the type of loft space that made New York City’s artist villages possible. Everyone imagines that Stockton’s urban renewal will happen the core of Downtown Stockton. What about the waterfront? Downtown Stockton certainly has its underused buildings. According to Burns, there are some structures in which the ground floor is in use but the upper floor is less than fully utilized, if at all, owing partially to outdated design. And then there are the downtown hotels that seem to sink into further decrepitude with each passing month. But unless the city embraces benign neglect and allows a little below-board tinkering, or rules are eased to allow for more reclaiming of this unused space, it’s likely most of the underused but habitable places will continue to languish. And not even the most intrepid bohemian is likely to turn one of the city-owned hotels into a livable space. That would take serious investment from someone with deep pockets, or an innovative partnership with a nonprofit that hasn’t yet come to fruition. But another space that’s uniquely Stockton could offer a different type of usable frontier. Namely, the waterfront. The waterfront helped Stockton become a boom town following the Gold Rush years, and it could lead to the reinventing of downtown. 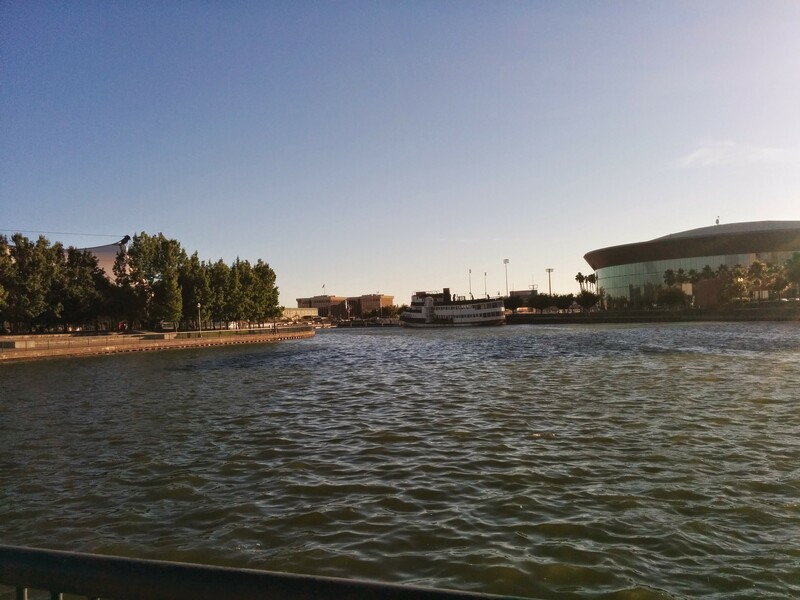 Despite the extensive work that’s gone into revitalizing the waterfront, the area is underused, and there are plenty of ways this potential Gold Coast of Stockton could be developed. Some might be more practical than others. For example, it isn’t difficult to imagine a community of houseboats lined up along the channel’s north shore, providing the type of built-in residential base that developers and planners agree is vital for a sustainable, walkable downtown. 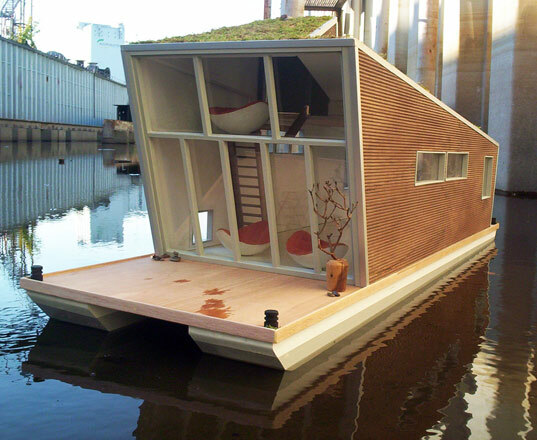 After all, houseboats were a common residence in Stockton’s earliest years. Commercial opportunities exist as well. Take the Sherman, a 92-year-old ferry boat that’s been moored near the Stockton Arena for nearly a month. According to The Record, the owners hope to retrofit the historic vessel into a hotspot for food and entertainment. More of these types of creative, out-of-the-box uses for the waterfront are possible — though as with most urban pioneer movements, there could be trouble to making them fit within the law. The city of Stockton or private landowners — not to mention the Department of Boating and Waterways — could make guerilla-style houseboating difficult for a flotilla of river rats moored on a high-profile levee. Or, perhaps ‘legitimize’ the effort and quest via an annual “California Delta Gateway-Stockton National Architectural Houseboat Design Competition” opened to wide spectrum of architectural and design firms, and/or architectural students. What better city to host such an annual competition than Stockton located at the Delta Gateway. Aesthetically innovative and creative concept designs would be thrust to the forefront and the constructed designs could be displayed along the channel in a public exhibition for viewing in tandem with its own design festival. The houseboats might ultimately be sold in an auction and moored by the residents along the channel for a year tenancy until the next annual competition, or moored permanently with subsequent designs added to the urban waterfront collection. John Vierra won 1st place in the 2009 Bohemian Flats Boathouse Student Design Competition. This year’s competition focused on rewarding small-scale design excellence, highlighting the unique aspects of designing a boathouse and building knowledge about materials, products and assembly contributing to a sustainable and safe environment. The Schwimmhaus by German architects Confused-Direction is a green hausboot (oops, house boat) designed to float around or just stay put on the shore. 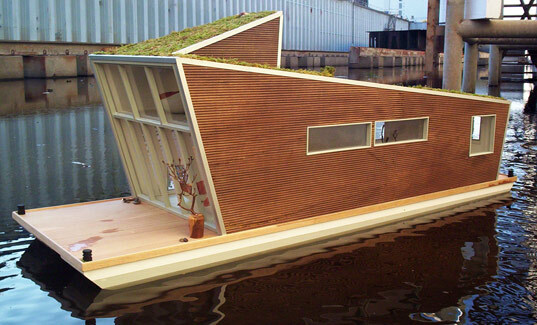 Its modern pre-fab aesthetic sets it aside from most maritime-y houseboats, and a green roof adds freshness and sustainable cred. Still under construction, Schwimmhaus is being built from wood salvaged from an old farm house in addition to other sustainable building materials. I agree Jon, Stockton needs a much larger interest in it’s overall City Design/Planning. It’s typically cities who embrace Design and forward leaning architecture, that take advantage of holding these design competitions Jon mention’s [such as Amsterdam, Toronto, Buenos Aires, Graz.] Stockton is not yet a ‘Design City’ but has the potential to become a center of well publicized design projects (and education!) while encouraging more young creative talent to set up shop/home in the city. The waterfront is most definitely the most visible and unique places in the entire city. Land around the waterfront should be not just thought of as prime real estate but THE most important real estate in Stockton (or even the county). At least in terms of a recognizable landmark or place, downtown Stockton act’s almost like a billboard advertising the area’s status (image). It would be unfortunate that any new construction along the waterfront be less than spectacular. Show off your best (aesthetic) asset Stockton!